The RagaMuffin is a large cat with a thick, medium-length coat that comes in all colors and patterns. Males weigh 15 to 20 pounds, and females are 10 to 15 pounds. Both sexes are heavily boned, and do not mature completely until the age 4 years. RagaMuffins are known for their sweet, endearing personalities. They thrive on attention and love sitting in laps. They also get along great with children and other pets. Although the RagaMuffin’s coat is of medium length, it are easy to care for and only requires brushing once a week. RagaMuffins need a lot of attention to be happy. They don’t like being left completely alone for hours on end, and do best in multi-pet households. RagaMuffins love kids and enjoy interacting with them. RagaMuffins are believed to be free of genetic disease. The RagaMuffin breed was first developed in the early 1960s from feral cats taken off the streets of Riverside, California, by a breeder named Ann Baker. Baker bred for cats of different colors with a docile, easy going temperament. Baker named the breed Cherubims. 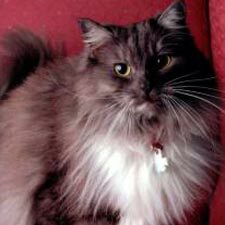 Some years later, the breed was renamed RagaMuffin to reflect the mixed breeding that went into developing these cats. The breed was recognized by the American Cat Fanciers Association in 1994. In 2003, the Cat Fanciers Association accepted the RagaMuffin into the Miscellaneous category.